If you have ever been inspired by Tolkien to write a poem or story, or paint your own vision of Middle-earth and its peoples here is the place to post them for us all to share. Our Yule Season Contest showed what a talented members we have here and my hope is that by giving our efforts a proper home and chatting about our work we will be inspired to carry on being creative and stretch ourselves. One thing I’ve realised while researching and writing the Artists in Profile series is the fact that there are as many visions of Middle-earth as there are artists and everyone has something unique to offer. Even if you have never done anything like this before why not get out your paintbrush and your pen and give it a go? To help us along I’ll post a theme every now and then to give us a focus. But don’t let that stop you posting your other efforts! 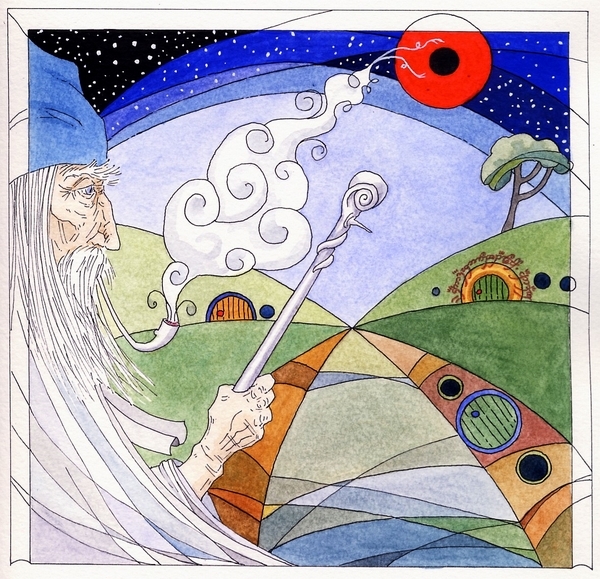 Stories, poems and art posted here must be within the bounds of Tolkien's writings. They should be true to Tolkien's universe and not run away with his characters in directions we know he wouldn't have taken them. We expect them to be respectful and guided by what the Professor has himself created. We reserve the right to remove any fiction or artwork that steps outside these bounds or which isn't in keeping with this site's PG13 rating. Copyright for all creative works will, of course, remain with the author. If you need help posting your work please pm me here at Middle-earth-journeys or email me at [email protected]. So - let's get creative and have some fun! Last edited by Iolanthe on Thu Jan 13, 2011 8:41 pm, edited 6 times in total. To start us off, how about reminding ourselves of what we can do? Here are all those wonderful Yule poems, all of which deserve a permanent home here. A Hobbit lives in the Shire. He's wearing his winter attire. To be far from the warmth of the fire. This Hobbit makes ready for guests. He's had a bazillion requests. All want to be present. A big bunch of Shire-folk pests. To Hobbits, both the big and the small. From the land to the South by the Sea. When Elessar, the High King comes to call. When the air is chilly and cool. 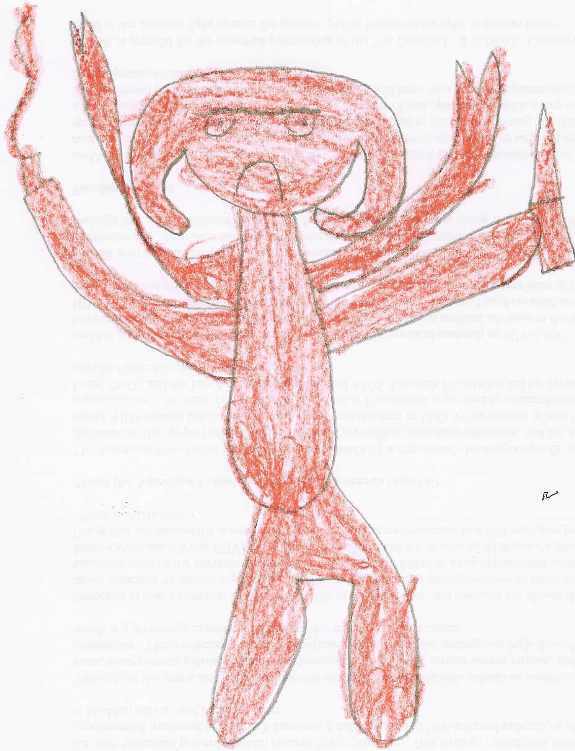 Brought to life by the Tolkien school. A time of light and joy for everyone. And young & old alike joined in the throng. "Let there be peace on Earth! goodwill to all!" On the winter soltice, the shortest day of light did the nine depart. From Rivendell did two Men, four Hobbits, an Elf, a Dwarf, and a Wizard set out on a quest. Their task was to undo a great evil, a ring of power and pain to be made undone in the fires from whence it came. hard as living rock, and the wizard; wise servant of the secret fire. Of all these skills none were greater than the love they bore. Blessed were they of Elbereth who's grace shone upon them, yet even unto the darkest places of Middle Earth. For pity would undo what malice had wrought. On that longest night did hope shine within thier hearts which would guide them to what end they did not know. All roads lead to one end and darkness passes into fair morning light. to friends afar in the world outside. The land across the seas. In shades of grey and gold. To elves and hobbits bold. By a guy in a weird helm! So do you have a Christmas Tree? To those who are deemed wise. but not without daily cheer. a warm hearth inside a bar. and the maiden bell flowers. That would be quite appalling. On an open fire. That would be grand. And pud with flaming brandy. And warm my toes upon his knee. Head bowed to knee, overwhelmed. “The road to my destiny . . . my hope . . .
Of the blessed Lady’s immaculate stars. Remembering his beloved’s words of faith . . .
To honor his Lady’s belief. In faith . . .
For when in danger who would come to aid? For then they heard a dark voice speak. While Gimli was thinking and scratching his beard. “Now shall we go?” asked Gimli, excited. But Gandalf was not very delighted. And it was something none could bear. Moria. The name made Gandalf shiver. For who knew what this Shadow could deliver? “They have brought a cave troll!” interrupted him. The troll that came was very grim. Legolas trembled, “What is this? With tales of the Balrog he was acquainted. At the Bridge of Khazad-dum, Gandalf fell. They had to tell Galadriel. What a terrific idea Iolanthe. I wonder what will come next? Sam was inspired to write about his wonderful fireworks. Let's see what we can come up with ! Hope this makes the details a bit clearer! 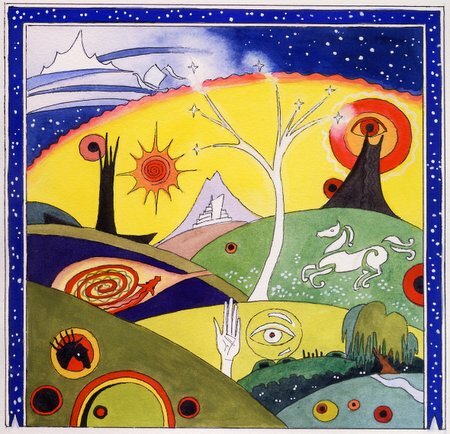 There are little eyes watching in the old forest, barrows and standing stones on the Downs, the Nine all over the picture represented as the Eye of Sauron as they only have his will, there is simbelmyne on the Green Field with the White horse of Rohan and Saruman can be seen looking out of the Palantir. At the top an elven ship can be seen taking the Straight Road . Last edited by Iolanthe on Sat Jun 17, 2006 5:08 pm, edited 1 time in total. Thanks for posting a larger version of this, Iolanthe, it's one of those pictures where you see more the closer you look. I love the way you invite the viewer to progress from the everyday hobbit hole in the foreground to the shores of Valinor in the distance. As you know, I am not in a position to contribute any artwork/poetry to this thread at the moment, but I've enjoyed looking at your picture and hope that there will be other stuff posted here soon to take a look at! This is wonderful, Iolanthe! It seems simple, until you start looking. I like the starry banner as a border, too. Okay, just so I don't lose my courage, I'm working on a Gandalf poem that might be ready in a few days. I'm not very good at this kind of thing, you know, so don't get your hopes up! And if I can try, so can all of you! That's the spirit, Merry! It's all in the doing and just having a bit of fun doing it . It's nice to try something different. I'm working on a Gandalf painting to go with it. Re-reading all the descriptions of Gandalf with his blue hat and scarf and eyebrows that come out further than his hat was interesting. I'm not sure what kind of hat has a brim that eyebrows can be longer than so my Gandalf has no brim at all. Either that or his eyebrows are so long he could comb them over his head . It's more of a symbolic and inner vision of Gandalf, the Shire and the presence of Sauron than a relalistic illustration. It probably shouldn't need any interpretation but you can see Gandalf watching and protecting the Shire, and Bag End surrounded by the One Ring. The Tree above Bag End is Gandalf's sign. The smoke from his pipe is obscuring Sauron's sight and his staff it pointing towards him and protecting the Hobbits. I've made his hat blue and his eyebrows do stick out from under it . Last edited by Iolanthe on Sat Jun 17, 2006 5:07 pm, edited 1 time in total. What a gorgeous picture, Iolanthe! Well done! Also thanks for the larger version of Tolkien's World. I love all the little details you put in both works of art. I'm really glad you like it Airwin! Some bits of it gave me some grief but I find if I stare at half finished paintings long enough I usually find a solution to rescue it . Great Job Iolanthe! I love it. There is, and I hope we'll see a bit more of it from people .